Spades involves four players who play as fixed pairs. To choose a partner, the players will either select them in person or pick from a deck of cards. Once the partners have been selected, they will sit opposite each other during the game. Spades is played using a standard 52-card pack, with the spade suits always as a trump and cards ranking from the highest (ace) to the lowest (2). A record of the scores is kept every time either of the opposing teams records a win. Bidding – Bidding begins from the player seated on the dealer’s left hand side and proceeds in a clockwise direction. Once the cards are distributed, each of the players surveys his cards and estimates the number of tricks they think they can win. Every participant is required to make a bid of at least one and cannot pass. Since spades are always trumps, no suit is named to be trumps. The sum total of tricks picked by members of the same side is known as a contract. For the first trick, the player seated to the left of the dealer cannot lead a spade. When the game takes a clockwise direction, all players must follow the suit led. If they are unable to follow the suit, they are allowed to play any card. Unless the led suit is a trump, a player will not have to play a trump. The highest card in the suit will win the trick provided a spade does not trump the trick. There are also instances where more than one trump will be played in one trick, resulting in the highest trump winning. Rules about spades – In the event that spades are not the led suit, the rules allow for a spade to be played if the player has no cards in the led suit. There are two instances that allow for a spade to be led. This is when a spade has trumped a previous trick of a different suit or when spades are the only cards left in the hand. The player who wins a trick will lead the subsequent trick. Keeping a record of the scores – In order to make the process of keeping scores simple, the cards in a trick should be piled so that they remain visible to all the four players. This will allow the players to count them both during and after the game. Scoring – Before the game begins, the players should agree on the score that is required to win the game. While in most cases the score will be a multiple of 100, the custom is to place it at 500. Once a contract has been made between two partners, the score will be obtained by multiplying the number of tricks by the number 10. 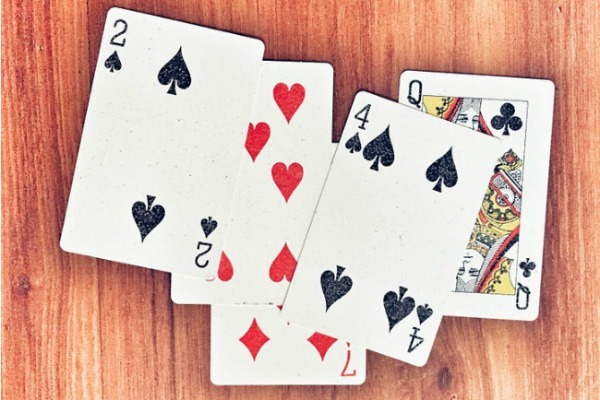 Scoring in a game of spades is quite an interesting phenomenon. Each of the tricks that a team wins above their contract is known as a sandbag. For every sandbag, one extra point is included in the score of the duo. However, failure to make the contract results in the team losing 10 points for every bid. This is designed to make the game more competitive. Sandbags – A game of spades has penalties for sandbags as a way of discouraging underbidding. When your sandbags add up to a total of ten, 100 points will be deducted to the total score of your team. In case your sandbags total to a figure over ten, the leftovers will begin a fresh count as they move towards ten. Helpful tips – Although sandbags are designed to prevent underbidding, they also make the game more challenging. Since winning extra tricks will not help your team, the best thing to do would be to strive to have both the high and low cards in a suit. This means that you will have control over the winning or losing of a trick. By doing this, you will also control each round of the game. Variations – Different players can introduce creative rules in order to have a variation of a game of spades. One of the options is to have (2) ranking between the king and ace. All players can also agree, for the first trick, to put out their lowest club. This will change the strategies for playing and bidding since the high club will win the trick. Should I always play the highest of a trick? There is an advantage that is usually associated with being the last player in any given trick. This is because it gives you the opportunity to view all the cards that have been played. In the long run, you will be in a great position to determine how to play appropriately. When the highest of a trick is played, what are my options? In a game of spades, middle cards are usually regarded as dangerous. These cards cannot be relied upon to take tricks but can take bags at the tail end of the game. You should go with the middle cards first if majority of the tricks are kings or aces, before dumping the lower cards. However, betting on queens and jacks may require that you keep middle cards. Can I play a low card in trumping? Yes. However, it is important to remember that another player can play a higher spade. This is why it is better to use middle spades in trumping. What Are Some Stupid Things You Did As A Child?